World Games are the highest level of competition for Special Olympics. There are World Winter Games held every four years and World Summer Games held every 4 years. Like the Olympics Games, they are on a schedule so that every two years there is a World Games. Athletes selected for World Games are done so by nomination. A nomination process generally starts approximately 12-15 months prior to the start of the Games. Prior to 2003, all World Summer Games events had been held in the United States, with only two World Winter Games events having been held elsewhere (1997 in Toronto, Ontario and 1993 in Salzburg and Schladming, Austria). In 2003, the World Summer Games were held in Dublin, Ireland. Nagano, Japan, played host to the next World Games outside the US, hosting the 2005 World Winter Games at many of the same venues that had been used for the 1998 Winter Olympics. The 2007 World Summer Games became the first Summer Games to be held in Asia when they took place in Shanghai, China. In 2009, the World Games returned to the US with the World Winter Games in Boise Idaho. After their brief return to the U.S., however, the World Games returned overseas for the 2011 World Summer Games. Those Games were held June 25-July 4, 2011 at the birthplace of the Olympic movement, Athens, Greece. Five Kentucky athletes and two coaches took part in those games, with Kentucky athletes claiming 14 medals. 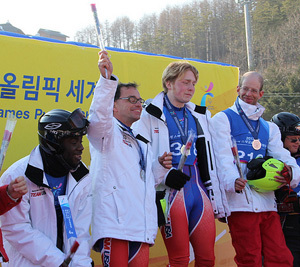 Two Kentucky athletes — Kelly McCormick and Rickey Oney — competed the 2013 World Winter Games in the South Korean Skiing mecca of Pyeongchang. There is no word as of yet as to how many Kentucky athletes will be participating in those Games. Kelly and Rickey won one medal apiece at the Games. The World Summer Games returned to the United States for the first time since 1999, when Los Angeles hosted the 2015 World Summer Games. Four Kentucky athletes traveled to Los Angeles as part of the Special Olympics USA Team, winning 11 medals, six of them gold. In 2017, the World Games once again leave the USA, when the World Winter Games are contested in Austria for the second time. Many of the ski events will be held in the same venues that hosted the very first World Games outside the USA in 1993. Two Kentucky athletes will compete as part of the Special Olympics USA delegation at the Games. For more information about the World Games or about how you can support the Kentucky athletes going to the Games, please contact Special Olympics Kentucky President/CEO Trish Mazzoni at 800-633-7403 or via e-mail at tmazzoni@soky.org.